After 30 hours of research, digesting both forum discussions and Amazon verified purchases, along with our own personal testing, we found that the Schmincke brand of watercolors were the best watercolor paints for professional artists. Not only did the Schmincke watercolor paints have excellent lightfastness ratings, but their high pigment concentration gave artists greater control over the layers in their painting – a critical aspect when watercoloring. In addition, Schmincke’s 139 colors should suit just about anyone’s color requirement. Now when it came to reviewing watercolor paints for beginners (i.e. students) and intermediates, the Winsor & Newton Cotman Watercolors was the best buy. This set by Winsor & Newton not only rivaled many of the professional grade paints on our list, but it was capable of producing vibrant colors at an affordable price. We found the best alternative to the Cotman watercolors were the Van Gogh watercolors by Royal Talens. 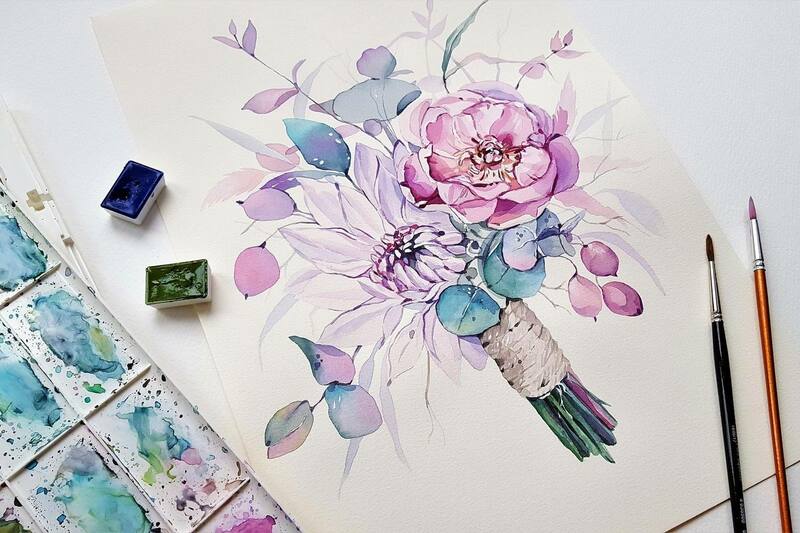 We spend a lot of time both researching and digesting all things when it comes to watercolors. 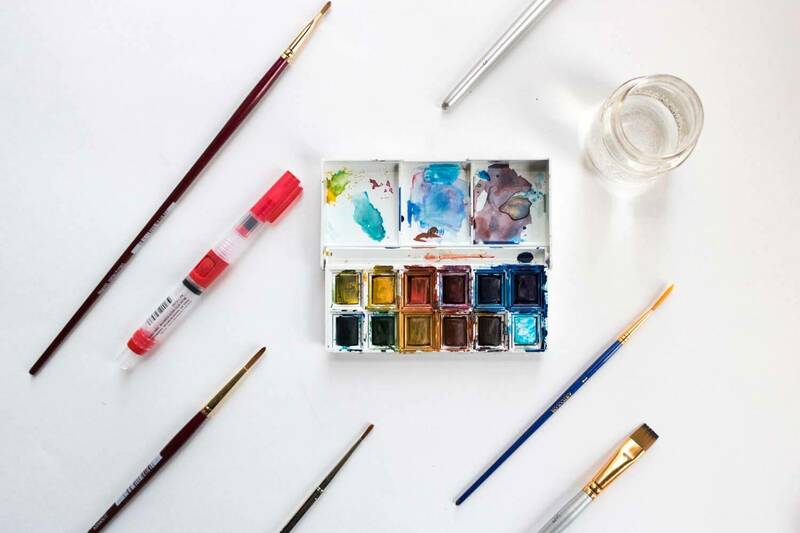 Whether it was our expansive review of the best watercolor brushes, watercolor pencils, or papers, we understand the importance that quality art supplies make. Not only will our in-depth research guide you to better performing art supplies, but it will also ensure that you don’t waste your money. While we understand that no product on our list will make any artist miraculously better, we do understand that a quality watercolor paint will provide the artist with much greater control over the medium. It’s through this process that we are completely transparent and want to serve you as best as possible. Furthermore, none of the listings below have been paid for. Our reviews are completely unbiased and aren’t being skewed in any way through backchannel communications with the company listed. Winsor & Newton has been both an established and highly regarded name within the art world for years. The quality of their watercolor paints both at the professional and student level are second to none. The Cotman line of watercolors have been recommended by the art community as a whole not only due to their incredible lightfastness rating of either I or II (indicating that its either very good or excellent), but equally impressive is their permanence. It’s with ratings like these that many professional artists find themselves still relying on Winsor & Newton Cotman watercolors throughout their entire career – they are just that good. Coming in both tube and pan form, you are able to purchase these watercolors to suit your preferences. Even though these watercolors do come as a set, you are able to purchase tubes individually from retailers like Blick Art Materials for a pretty affordable price. Coming in sets of 6, 10, 12, 14, and 24, you can get a set that not only fits your budget, but enough colors to get you started. This Classics starter set by Prima Marketing has all the essentials when it comes to watercolor painting. Coming with 12 half pans, not only will you have all the key colors that you will find yourself using in just about every painting, but the transparency properties of the paint itself were impressive for a starter set. Like the Cotman watercolors, the pans within the Classics set can be purchase individually both from their website or at Amazon. This will not only save you money as an artist, but if you are looking for a specific color in your piece, you can easily replenish. As great as this watercolor paint is for a student, one aspect that we and other artists loved was the palette. The metal palette not only has generous mixing areas, but also wells that you can use to truly pull out range within the colors themselves. 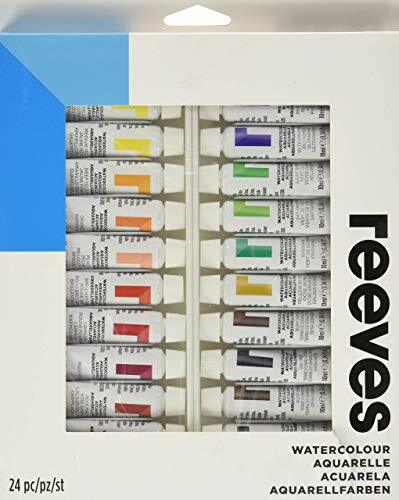 Reeves has been at the center of the art world since 1766 and is owned by Colart (same company that owns a variety of art brands including Winsor & Newton). Like its sister company Winsor & Newton, Reeves puts together quite a compelling offering of 24 different colors in this rather large 10ml watercolor tube set. With such an expansive color offering, normally you would expect to pay a lofty sum – however, it’s quite the contrary. With a price tag hovering around $15 bucks (at the time of publication), this set is definitely a great pick for those budding artists that want to get into the world of watercolors but don’t necessarily want to pay the high price of admission. As expansive as this set may be, there are a couple of missing components. Like most sets that come in tube form, you don’t get a mixing palette or brush. So, you will need to pick up a few extras upon checkout. Accessories aside, the colors within this product will certainly pop, and the consistency of the paint itself is manageable. 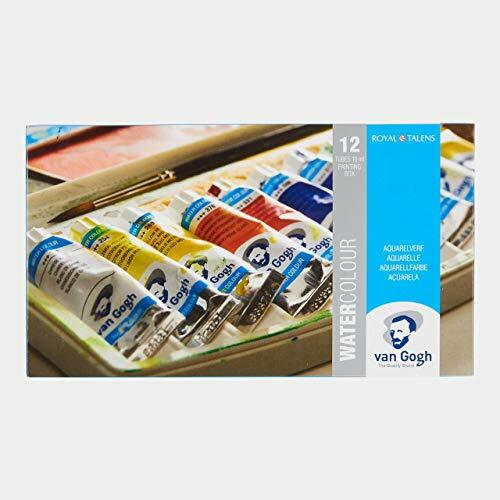 Bearing the instantly recognizable name of the Dutch Post-Impressionism artist Vincent Van Gogh, these high quality watercolor paints by Royal Talens are among the best you can find at an entry level price. While not nearly as expansive as the 24-set offered by Reeves, the 12 color set of 10ml tubes will produce extremely vibrant colors that rival most professional paints on our list. +++ Notes an excellent lightfast rating. This will ensure that the colors you place on the watercolor paper will remain just as vibrant for years to come. Secondly, and perhaps most importantly for you reading at home, is the transparency qualities of these paints. You will be able to achieve very subtle effects that will build up great atmospheres within your pieces when using the Van Gogh watercolors. Beyond the set of 12 tubes included, you will also get a round nylon size 6 brush along with a plastic palette with a mixing area. If you have the budget, this is one of the best kits for beginners. 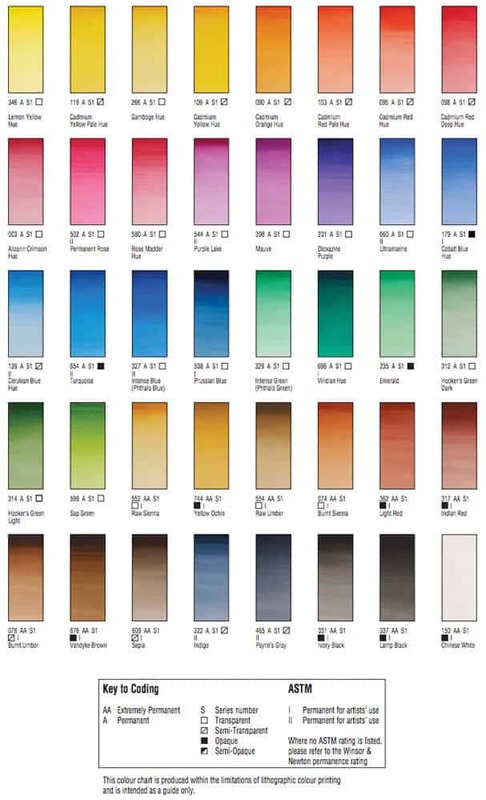 While some artists may argue that you need a tube for every color that you plan on using in your piece, this set of introductory watercolors by Daniel Smith takes quite the opposite approach. Containing only 3 warm and 3 cool colors, this set puts the onus on you to become a resourceful artist through mixing. While mixing (in most instances) will generate duller colors, Daniel Smith’s finely ground pigments will do just the opposite. Their vibrancy coupled with stellar lightfastness and transparency make for an artist grade paint at a beginner’s price. While this set is only for 6 key colors, Daniel Smith actually makes a range of more than 235 colors in total! Therefore, if you fall in love with these 6 colors (which we think you will), you can easily add more to your studio by purchasing them individually. The Introductory Watercolor set by Daniel Smith is a barebones set, so don’t expect to find a starter brush or palette included – you will need to purchase those separately. 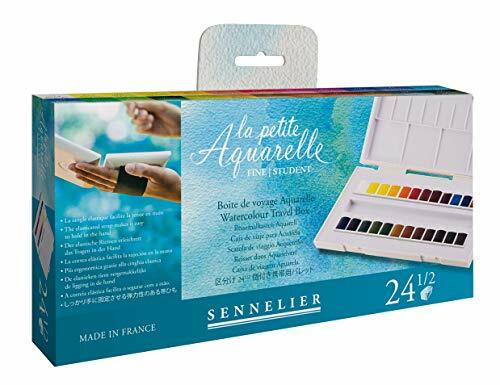 French based company Sennelier has quite the remarkable set of half pan watercolors for beginners. These honey-based watercolors not only will shine a bit more vibrant than most, but will retain their vibrancy with nearly all the colors included in the kit delivering an excellent lightfastness rating. 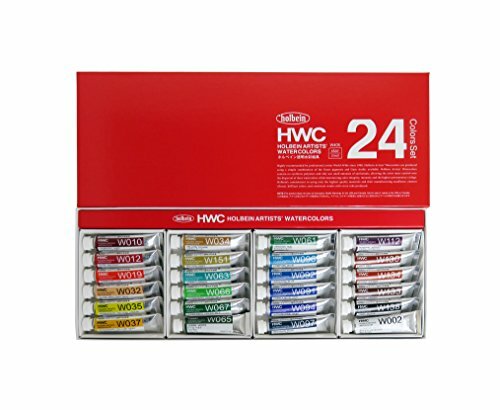 Unlike the Daniel Smith Introductory Set that we reviewed, this 24-color set takes a back seat to mixing – allowing you to focus squarely on painting. However, for those artists looking to dial in the exact color for their preference, you will be happy find that the Sennelier palette does come with a mixing area (which will further save you a few bucks when purchasing the set). But another really cool feature about this palette is for the plein air watercolorists, underneath the pan tray you will find a hand strap that can keep the palette secure. This is a hugely underrated feature that we think a lot of plein air artists will completely fall in love with. 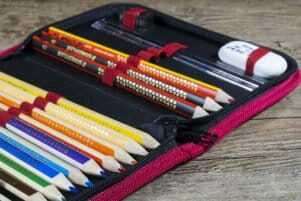 Overall, this set definitely gives the Winsor & Newton Cotman a run for its money! While we recently fell in love with the Grumbacher gesso, equally impressive in their wide array of art supply offerings is their introductory watercolor set. Containing a plastic palette for tube storage and mixing coupled with an assorted hair brush, you will have everything (with the only exception being paper and water) ready to get started with painting immediately! 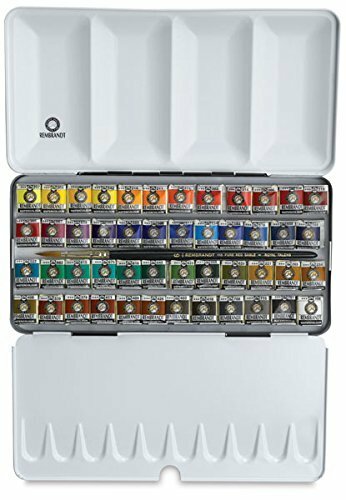 The 12 colors within Academy watercolor painting kit will flow like butter and will produce some amazing and vibrant results. While the lightfastness and consistency of the paint is incredible, what we really liked was the color guide on the Grumbacher website. This helpful guide not only tells you the lightfastness rating per ASTM, but it also discloses the pigment information. For instance, if you were using Alizarin Crimson, the exact color used was PR83. So, if by chance you run out of this particular color mid painting, you can go to the store and cross reference the color code (PR83) with other brands and get a very close color match (consistency, pigment concentration, and performance may differ). While this might not seem like too big of a deal for some, but for those artists looking to paint a large-scale piece, this reference number is extremely important. 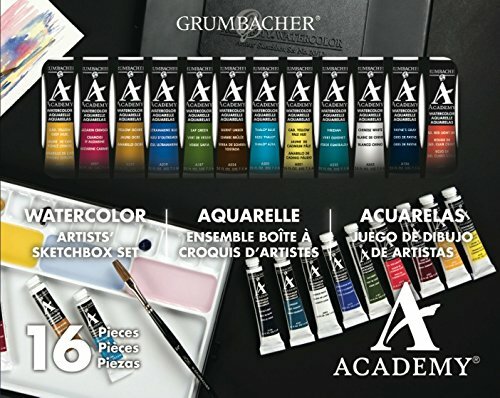 Lastly, for those looking to upgrade their Academy series paints, Grumbacher does offer a professional level paint with their Finest Watercolor series. These will have all the professional qualities like better transparency and higher pigment density – you can typically buy those paints individually at select online retailers like Blick Art Materials. 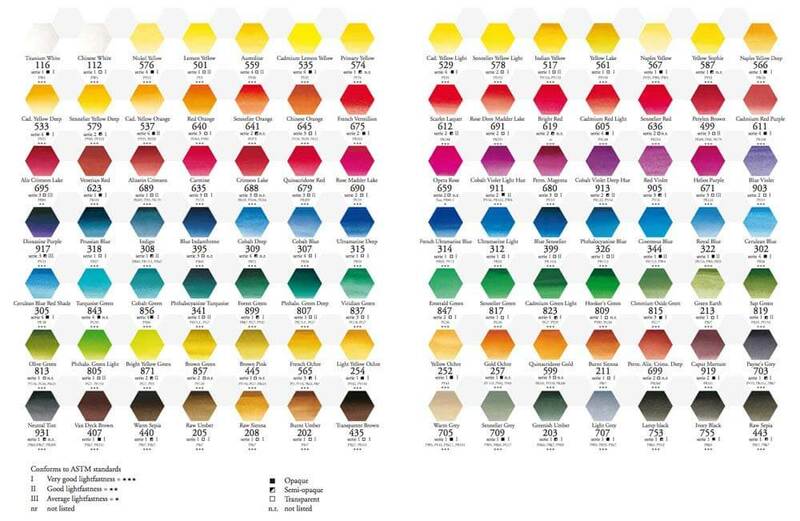 In true German form, the reference color guide that Schmincke provides for the Horadam watercolors is unlike anything that we have ever seen. Given that the pigment colors are the exact same between both their pans and tubes, you can easily swap out the products with one another and get expected and reliable results. For the animal conscious or vegan artists reading, the Schmincke pans do rely on ox gall – a common ingredient derived from cows that is used as a wetting agent. For professional grade watercolors it really doesn’t get much better than this collection from Schmincke – and most artists tend to agree. As evident in the 4.8 out of 5.0 review (with over 129 written at the time of publication) on the Blick Art Materials website, professionals love these paints often stating that they deliver a ‘vibrant hue’ to a more emphatic ‘well worth the price!’. Containing everything that watercolorists are looking for in a quality paint set including high pigment volume, permanence, transparency, and uncompromising materials, this watercolor paint by Holbein has it all. With 24 5ml tubes packed into this expansive yet affordable set for professionals, you will have all the necessary colors that you could possibly want. Perfect for artists who work on a much smaller scale, the 5ml tubes will have plenty of legs, and this is due in large part by quality paint found in each tube. 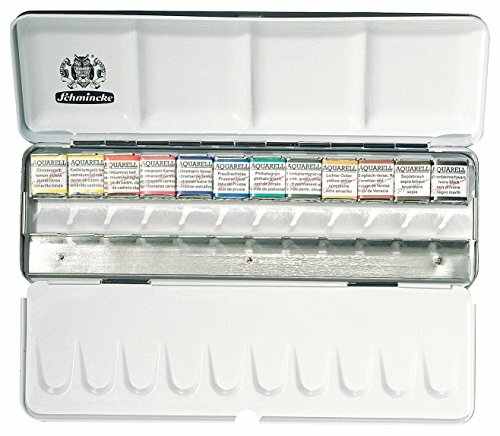 Like any quality watercolor, when you run through an entire tube, you can easily buy replacements at either your local art store (given Holbein’s wide distribution), or if you can wait a couple of days you can buy them online at retailers like Blick (only carry 15ml tubes individually) and Amazon. To really stress just how good these watercolors truly are, here were a few paintings we found that really showcase not only the beautiful colors attained but the subtle transparency other artists have achieved with the Holbein’s. Professional’s looking for archival quality, these paints wont crack and will easily retain their vibrancy for years. Furthermore, for the artists who paint on a slightly irregular basis, a simple rewetting of the Holbein’s will awaken them for easy reuse. A quick visit to the M. Graham website will not only guide you through their entire paint making process, but reinforces the time and care that they put into making their artist grade products. Why does a high pigment load matter? For the artist it means less paint is required while also giving you greater range over the transparency of the layers you plan on painting in your piece. But furthermore, M Graham is one of the few manufacturers that use honey in their watercolor paint. When used properly, it prevents the paint from fully drying out when placed on the mixing palette. Therefore, when you go to reawaken the paint after several days of disuse, you won’t experience any problems getting your paint back to its original form – a common issue for some of the student grade watercolor tubes. Now you might wonder if the inclusion of honey may have an effect on lightfastness. When we reviewed the M Graham color chart, almost all of their paint had an ASTM Lightfastness rating of either I or II. Of their 70 colors offered 61 had Lightfastness I, 8 had Lightfastness II, and only 1 had Lightfastness III (Alizarin Crimson). If you haven’t tried out the M Graham professional watercolor paints, they are worth a look. Artists have been pleased with their naturally vibrant results and incredible lightfastness. Lastly for the environmentally conscious artists out there, you will be happy to know that M. Graham has a completely non-toxic manufacturing process and is fully powered through 100% renewable energy – how is that for an eco-conscious company! Perhaps one of the most popular and well established brands on our list is Winsor & Newton. The Professional line of watercolors that Winsor & Newton puts together is equally impressive on all fronts. 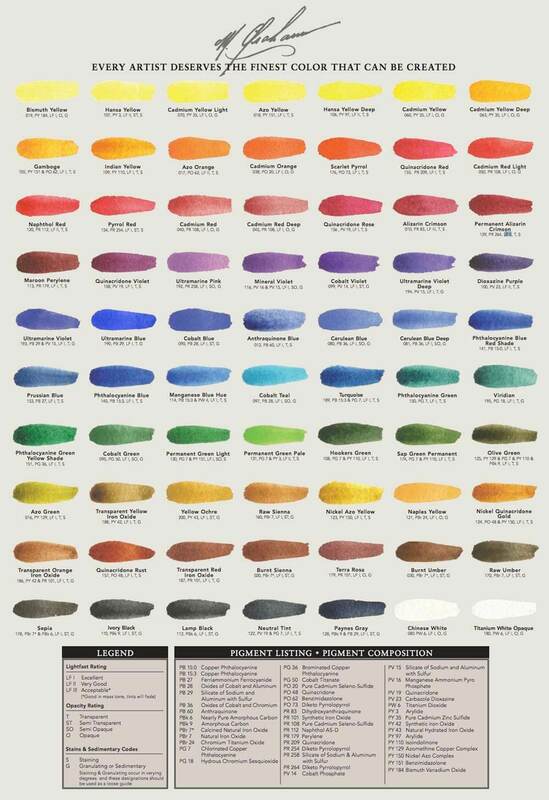 From their single pigment source found in 78% of all their colors, you will not only get extremely pure colors, but also consistent results. It’s through this reliance on a single source that you can really pull out the pigment as they say and create stunning transparency and build several layers in your piece. Of course, for the toxic heavy metals like the Cadmiums they mix their nearest similar color in order to produce striking results. For the professional artists reading, the permanence of the Winsor & Newton’s are second to none with 98% of their entire line of colors achieving either an A or AA rating. This will not only ensure that your piece looks the same as the day you finished it, but further generations will be able to view your artwork with the same vibrant colors that you originally intended. One aspect that we really loved about this 12 color 5ml tube set by Winsor & Newton is that it comes with a mixing palette. While we would be willing to bet that all professionals reading this likely have a palette within their studio, for the intermediates looking to jump to the next level and feel like they have outgrown the Cotman’s will definitely appreciate this addition. 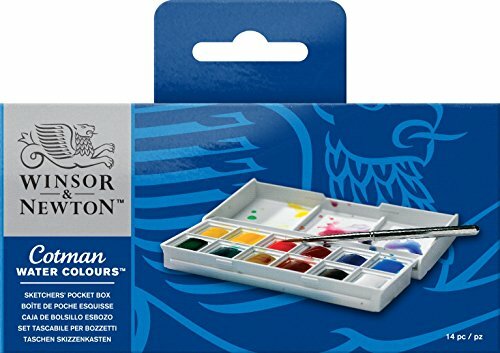 Given the price for the quality of the paint received, like the Cotman’s the Professional series by Winsor & Newton is not only an affordable watercolor paint, but will compete with even the finest watercolors on the market. While the 5ml tubes are pretty small, you can purchase individual paints through this page on Amazon or at the Blick Art Materials website when you need to refill. While we took a look at the Sennelier La Petite student focused watercolor set, we wanted to turn your attention to their professional series. Providing many of the same great features that were loved in the student set, you get those plus a higher pigment concentration based on natural materials where possible. So, when it comes to the honey and Kordofan Gum Arabic mixture, you will be able to pull out the pigment fully and have complete and total control over the transparency. Like the M. Graham paint, the honey composition found within these buttery watercolor paints can be rewetted with complete ease. Furthermore, the honey will prevent the Sennelier’s from cracking – making them absolutely perfect for professionals looking for unmatched archival ability. Printed on the front of every watercolor tube you will see the excellent lightfastness of these paints displayed. 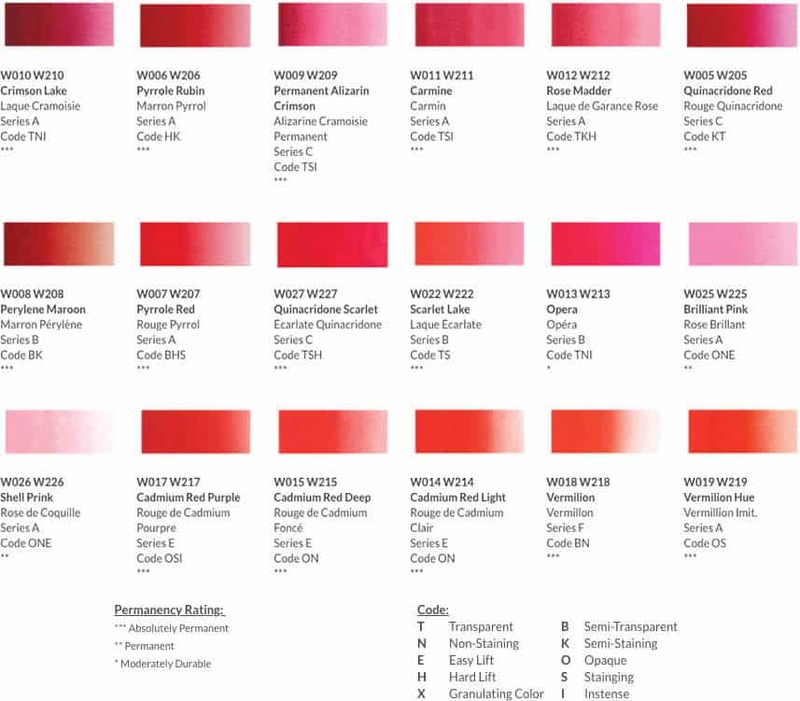 Of the entire lineup of paints made by Sennelier, only two aren’t rated as Excellent for lightfastness – Alizarin Crimson (Good Lightfastness) and Opera Rose (Average Lightfastness). You can see a full list of all the colors and their respective lightfastness rating along with their transparency here in the following chart. 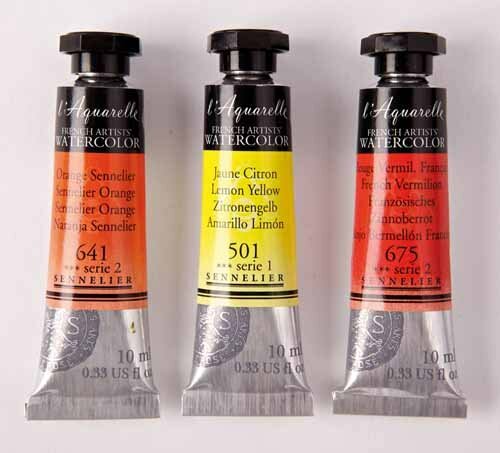 Like most professional watercolor paints, Sennelier does offer them on an individual basis. So, if you know what you are doing and want to build your own color profile or need a refill check out this listing at Blick Art Materials. The same company that makes the Royal Talens Van Gogh watercolors comes their professional series paints bearing the same name as the famed Dutch artist Rembrandt. 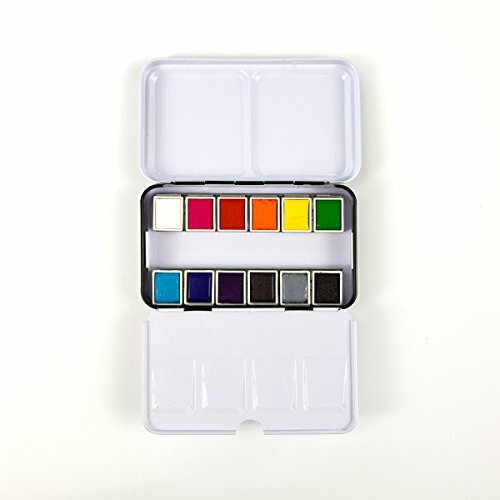 Featuring all the trademark features that make a professional watercolor paint stand out from the student varieties including excellent lightfastness, terrific transparency, intense and well saturated colors, you can really build up an environment in your next piece of artwork with this paint by Royal Talens. Unlike many of the professional paints reviewed so far, the Rembrandts come in a half pan form – making them not only perfect for travel use, but will still be incredibly brilliant despite the form of the paint itself. 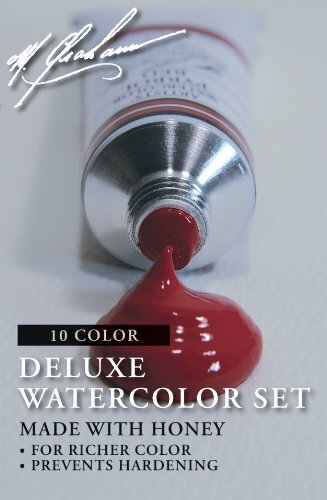 While the included red sable brush is a nice to have but not a must have for many artists experienced in watercolors (as you probably already have your own set of brushes you prefer), if you have a drawing or painting background and looking to dive in head first into the world of watercolors with this paint set, then you definitely can’t go wrong! 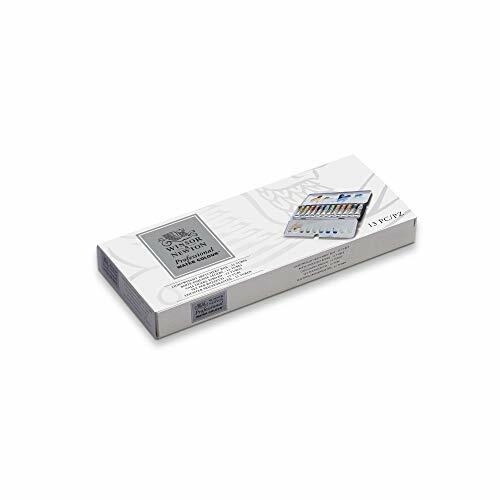 Now, if you are purchasing this as a gift either for yourself or someone else, the beautiful wooden professional box Rembrandt offers everything you could possibly want to begin your watercoloring career – except the paper of course! 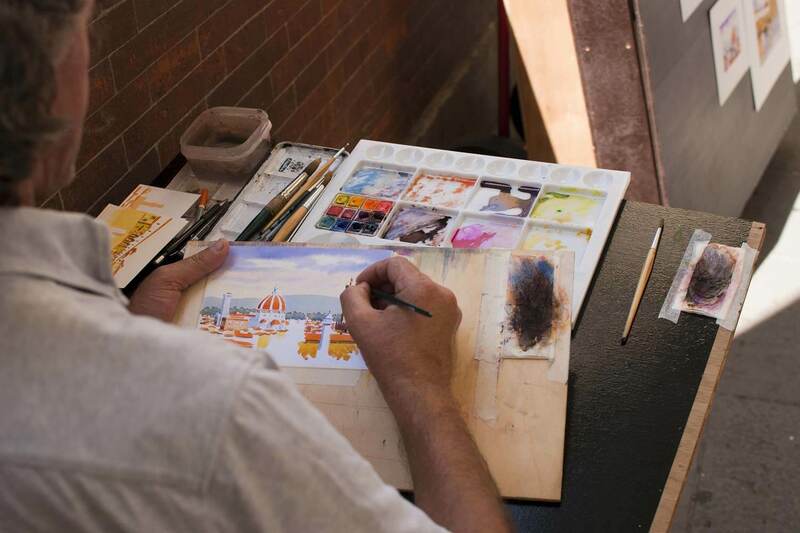 While largely producing the same results when it comes to watercoloring, there are some nuances about these forms that may give the artist preference of one over the other. With everything being equal, when it comes to comparing these two forms, tubes tend to be a bit more vibrant in color and will be much easier to mix (as the paint comes out in liquid form). Setting up tubes does require a bit of additional work. First and foremost, you will want to make sure that you have a watercolor palette with not only mixing areas but wells too. 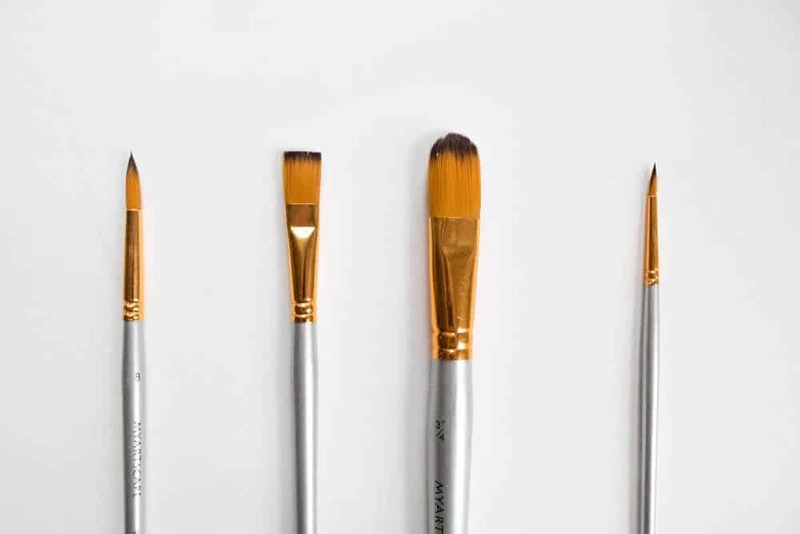 This not only ensures a better organization than if the paints were placed on a traditional artists palette commonly used in oil or acrylic paints, but it will help to preserve the paints longer as well (ultimately saving you money). Like pans, paint that has been expressed from a tube into a palette can be rewetted to help reduce waste, however, the preservation of the paint may not last as long when compared to a pan. While most watercolor paintings tend to be much smaller in nature, especially when compared to oil and acrylic paintings, tubes do allow you to paint at a much larger scale as the paint can easily be expressed from the tube (as opposed to constant rewetting of a pan). If it’s your first time trying out a tube or you plan on painting a smaller scale piece, a 5ml tube should be more than enough. Not only will the 5ml tube be cheaper, but it will also give you the opportunity to test out the watercolor paint and see if it meets your expectations. Pans on the other hand do tend to be a bit more travel friendly as they can be used just about anywhere (assuming you have either a cup of water or water brush handy). In addition to their travel friendly nature, pan colors (like tubes) can be purchased individually. This allows you to switch out pans easily within your palette. Conversely, pans do tend to be slightly less vibrant compared to their tube counterpart, however, if you are still at the beginner or student level, this likely will go unnoticed. Again, just like the tubes we mentioned above, if it’s your first time trying out a particular paint, we recommend opting for the smaller size allowing you to fully test out the paint before investing in a full pan (assuming they offer this size). What Really Is The Difference Between Student and Professional (Artist) Grade Watercolor Paint? 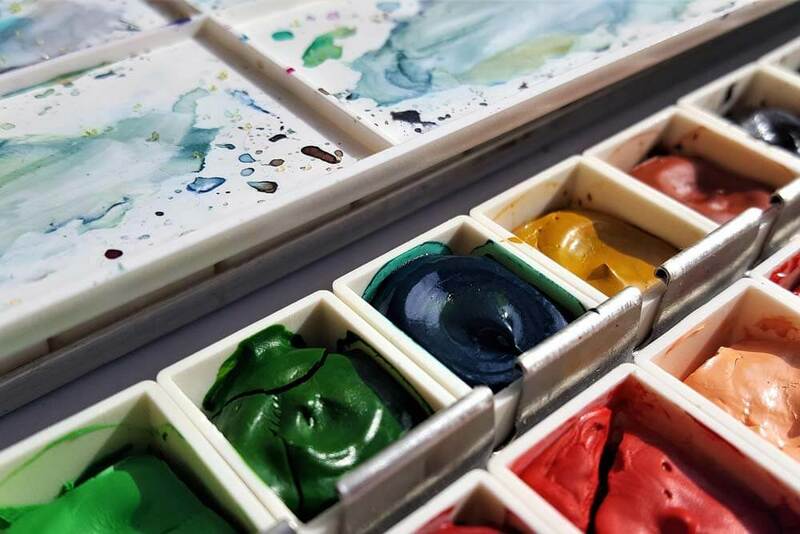 Now when it comes to selecting watercolor paints, you will find that the price can vary wildly between both the student grades and professional (artist) grade paints. This equates to a cost of $0.33 per ml. For the Alizarin Crimson it costs $0.69 per ml (15ml size). That’s a 109% increase in price between the two products! Note: If you were to calculate out the Amethyst Genuine, the cost is $1.15 per ml, or a 248% increase over the student grade version! Is it really worth paying (at minimum) twice the price for a tube of paint? If you are just starting out with watercoloring, we would recommend going with the beginner or students sets. 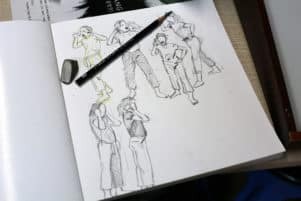 However, for those that are a bit more seasoned of an artist (or have a background in painting or drawing), even at the intermediate level, we would suggest upgrading your palette to the professional or artist grade offerings. With student level paints, the pigment itself is largely made through synthetic ingredients. A watercolor paint based on synthetic pigments won’t be nearly as vibrant when compared to an artist grade quality. As found with professional paints, they mostly use natural pigments. Therefore, if you get a Burnt Umber watercolor paint, it was in fact sourced from the natural earth pigment. 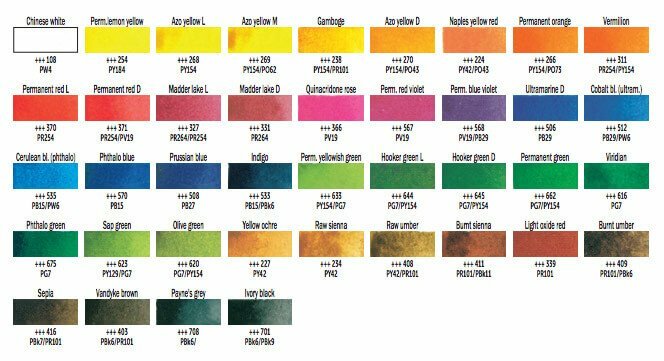 When selecting professional watercolor paints, it’s always advised that you purchase a paint (when possible) made from a single pigment. Mixed pigment paints may lead to unintended or uneven results depending on how the well the manufacturer conducted the mixing when making the paint. Whenever you see the name ‘Hue’ added on to the name (ex: Cadmium Red Medium Hue, Cadmium Yellow Deep Hue, etc.) these don’t contain the mineral or the natural pigment source listed on the side of the tube or pan (as evident with cadmium, it’s a very toxic heavy metal), but instead contains a mixture of pigments to achieve the same color. Now when it comes to painting, when looking at these two types of paints closely, you will find that artist grade paints in tube form tend to be much more buttery and pleasant to work with. Consistency aside though, with professional grade paints, you will also be able to pull out the paint quite a bit more. This will allow you to have beautiful gradients and remarkable transparency within your artwork. When reviewing watercolor paints, you will often see the term Lightfastness listed on the side of the tube or pan. This is incredibly important when painting with watercolors. As stated on the ASTM website (a body that oversees the labeling of art supplies), they describe in great detail on how lightfastness is determined. 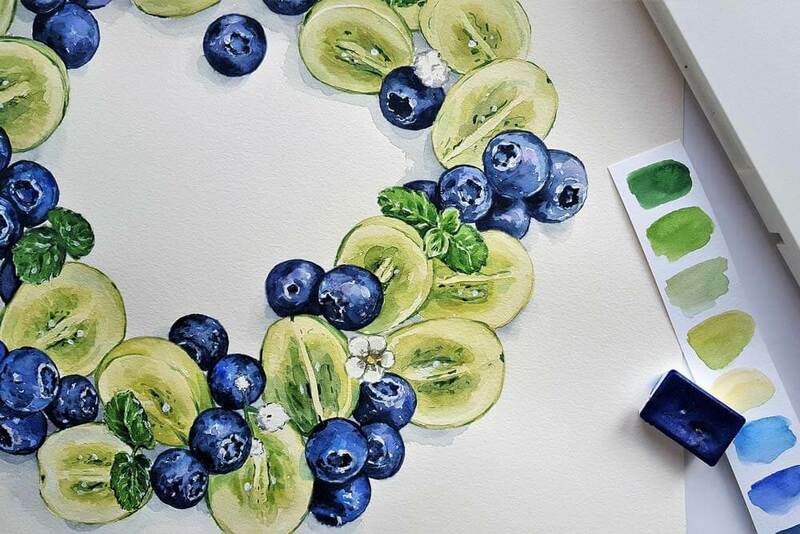 When picking out a professional watercolor paint, you will always want to go with a watercolor that has been rated at a Very Good or Excellent lightfastness. Paints of lesser quality will be susceptible to fading within a few years and could completely change the look of the painting. Now there are a few ways that you can combat lightfastness. First off, never hang your painting in direct sunlight. The UV rays emitted by the sun will slowly deteriorate the paint and ultimately bleach the colors. Humidity can also influence the painting colors itself, so if possible, display paintings in a dryer environment. Lastly, when hanging your painting, put it in a frame with a UV resistant glass. This will help to preserve the colors that you intended when painting the piece. In order to get the most out of your watercolor paints, it’s important to get a brush that is compatible with watercolors. All too often student artists will try to adopt a one size fits all approach with their paint brushes. But this is severely misguided. Acrylic and oil brushes aren’t designed for water retention, nor are they well made for the lighter pigment load. Ultimately it will show in the final piece that you create. Therefore, we recommend picking up a few watercolor brushes when just getting started. 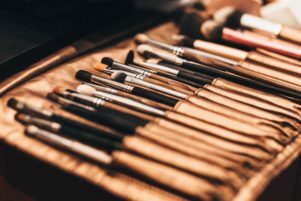 Even some of the synthetic brushes we reviewed can begin to rival the highly-revered kolinsky sable brush when it comes to performance. If there is one single aspect of watercolor painting that can really make a difference when it comes to results, it will undoubtedly be the paper itself. Watercolor paper is specially made for artists looking to not only employ a variety of techniques within their work, but it will also feature key absorbency aspects. Or even sprinkling salt on your painting, watercolor paper can withstand just about anything you throw at it. While we recently compared and reviewed the best watercolor papers currently on the market (Hint: it was this Aches Watercolor Block), you will find that they come in a wide variety of forms and production types. This will ensure that the paper can withstand several layers of a wash and won’t be susceptible to any warping. If you are just starting watercolors for the very first time, don’t waste your money on professional (artist) grade supplies. While they can be incredibly superior to the student grades, when it comes to making any form of artwork, whether its oil, acrylics, and yes, watercolors, it’s all about the talent of the artist that really matters. While we never want cheap/inferior supplies to get in the way of a determined artist, when it comes to watercoloring, the most important aspect isn’t lightfastness, transparency, or pigment concentration of the paint, it’s about the talent of the artist. Get out there and start painting!